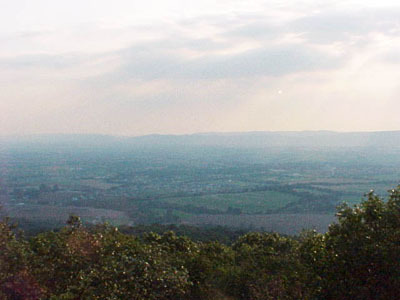 Taken from the highest point in Gambrill Park, this shot looks west over Middletown Valley which held the three farms owned by Johann George Mehn. 1. 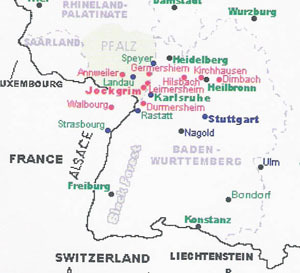 JOHANN GEORGE1 MEHN was born 1722 in Lothringen (Alsace Lorraine), Germany, and died 1773 in Frederick Co., MD. He married ELIZABETHA, Abt. 1740 in Pennsylvania. She was born Abt. 1728, and died Bef. 1777 on homestead plot, near Big Spring, Frederick Co., MD. Fact 2: In the naming tradition of Germans, boys were all named the same first name (John or George, etc.) and called by their different middle name. Thus George Adam was called "Adam." 2. i. GEORGE ADAM " ADAM"2 MAIN/MEHN/MAINE, b. 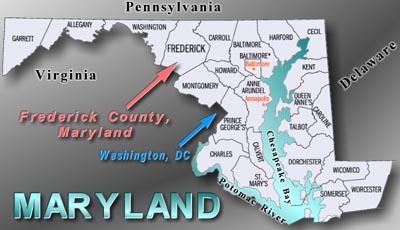 May 14, 1746, Frederick Co., MD; d. May 17, 1822, Frederick Co., MD. 3. ii. 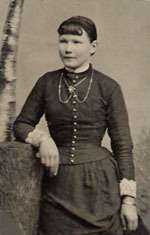 MAGDALENA MEHN, b. Bet. 1740 - 1744; d. Abt. 1795, Frederick Co., MD. 4. iii. JOHANN GEORG MAIN/MEHN, JR., b. Abt. 1744, Frederick Co., MD; d. 1822, Frederick Co., MD. 5. iv. JOHANN FRIEDRICH/FREDERICK MAIN/MEHN/MAINS, b. August 08, 1754, Frederick Co., MD; d. May 30, 1833, Frederick Co., MD. 6. v. JOHANN MEHN, b. 1756, Frederick Co., MD; d. April 16, 1832, Frederick Co., MD. vi. ANNA MARGARETHA ROSINA MEHN, b. October 13, 1759, Frederick Co., MD; m. JOHANN ADAM SIMON, March 02, 1778; b. Germany. 2. GEORGE ADAM " ADAM"2 MAIN/MEHN/MAINE (JOHANN GEORGE1 MEHN) was born May 14, 1746 in Frederick Co., MD, and died May 17, 1822 in Frederick Co., MD. He married APOLLONIA WEIL 1770, daughter of JOHANN GEORGE WEIL/WILES and SUSANNAH ELIZABETH (also referred to as MARIA ELISABETHA). She was born Abt. 1750, and died Bef. 1790. From George Adam Main's1822 will, his signature at right is in German script. 7. i. JOHN FREDERICK "FRED"3 MAIN, SR., b. April 17, 1774; d. April 30, 1850, Frederick Co., MD. ii. 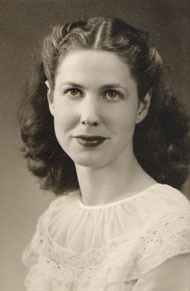 ELIZABETH MAIN, b. March 27, 1772; m. PETER MICHAEL, March 06, 1792; b. 1775, Middletown, Frederick Co., MD. iii. MARIA MAGDALENA MAIN, b. Abt. 1785; d. 1865; m. JOHN MATTHIAS SMITH, 1802; b. 1770, Pennsylvania; d. 1848. 3. MAGDALENA2 MEHN (JOHANN GEORGE1) was born Bet. 1740 - 1744, and died Abt. 1795 in Frederick Co., MD. She married CHRISTOPH STOFFEL BRAUN September 09, 1761. He was born Abt. 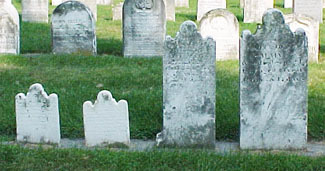 1741 in Neckaretz, Germany, and died January 1812 in Frederick Co., MD. ii. 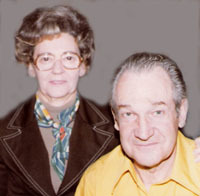 GEORGE PETER BRAUN, m. ELIZABETH SMAY. v. SUSANNA ELIZABETH BRAUN, b. April 09, 1770.
vi. JOSEPH BRAUN, b. April 02, 1772. 4. JOHANN GEORG2 MAIN/MEHN, JR. (JOHANN GEORGE1 MEHN) was born Abt. 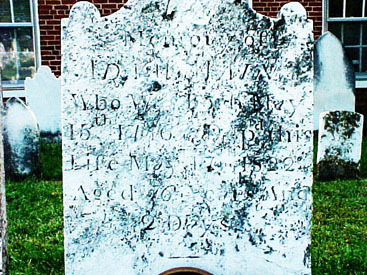 1744 in Frederick Co., MD, and died 1822 in Frederick Co., MD. He married (1) CATHARINA Abt. 1770. She was born 1750. He married (2) MARY MAGDALENA Abt. 1772. She died 1836. 8. i. CATHARINE3 MAIN/MEHN, b. December 1771; d. July 12, 1855.
ii. ANNA MARIA3 MAIN/MEHN, b. April 27, 1773.
iii. MARIA ELIZABETH MAIN/MEHN, b. September 18, 1774.
iv. SUSANNA MAIN/MEHN, b. September 30, 1776.
v. HANNAH MAIN/MEHN, b. March 20, 1778.
vi. JOHN GEORGE MAIN/MEHN, b. September 03, 1780.
vii. CHARLOTTE CHARITY MAIN/MEHN, b. 1782.
viii. ANNA MAIN/MEHN, b. 1784.
ix. JOHN WESLEY MAIN/MEHN, b. May 12, 1786.
x. JOHN FREDERICK MAIN/MEHN, b. May 22, 1788. 5. JOHANN FRIEDRICH/FREDERICK2 MAIN/MEHN/MAINS (JOHANN GEORGE1 MEHN) was born August 08, 1754 in Frederick Co., MD, and died May 30, 1833. He married SUSANNAH PECKENPAUGH/BECKENBACH Abt. 1775 in Frederick County, MD. She was born Abt. 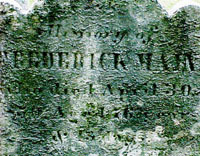 1758 in Pennsylvania, and died March 05, 1848 in Greenfield, OH. i. ELIZABETH3 MAIN/MEHN, b. February 11, 1776; m. ...MILLER. ii. CATHERINE MAIN/ MEHN/MAINS, b. August 21, 1777; m. JOSEPH KOPP/COPP; b. March 1773, Virginia; d. September 08, 1856, Fairfield Co., OH. iii. SUSANNA MAIN/MEHN/MAINS, b. Abt. 1780; m. JOHN MILLER, June 08, 1802, Berkeley Co., VA (now WV). iv. 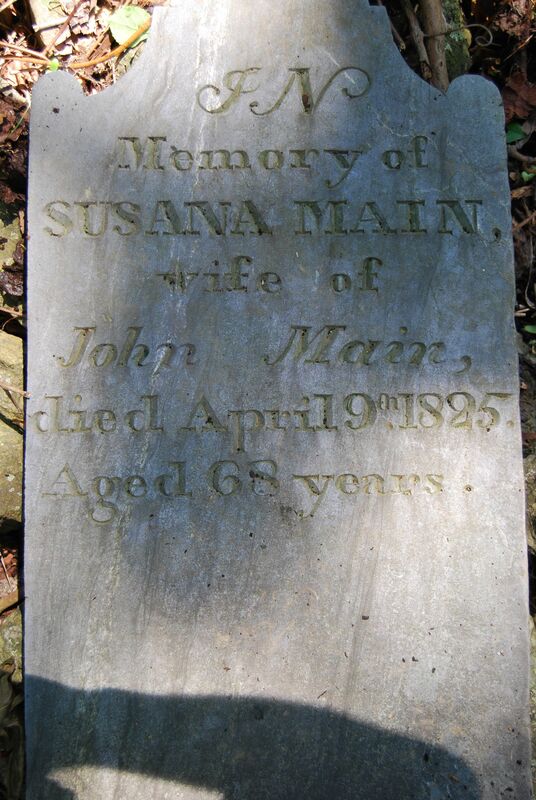 JOHN MAIN/MEHN/MAINS, b. February 14, 1784, Frederick Co., MD; d. July 13, 1881, Greenfield, OH; m. ANNA SMITH. v. JACOB MAIN/MEHN/MAINS, b. January 12, 1794; m. ELIZABETH FIDLER. 6. JOHANN2 MEHN (JOHANN GEORGE1) was born 1756 in Frederick Co., MD, and died April 16, 1832 in Frederick Co., MD. He married SUSANNA 1777. 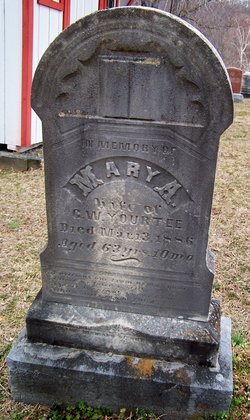 She was born 1757, and died April 09, 1825. Susan wife of Johann Mehn/Main is buried at the Main Family Cemetery off of US 40. Hers is one of the few stones still existing there. The picture, right, is courtesy of Bryan Main. i. ELIZABETH3 MEHN, b. May 04, 1778; m. JOHN SPEALMAN. ii. 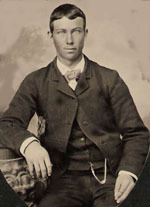 JOHN MAYNE, JR., b. May 23, 1780; d. October 1843, Frederick Co., MD; m. SUSANNA GITTINGER BALTZELL. iii. ADAM MAYNE, b. August 08, 1783; d. April 21, 1857, Clark Co., OH; m. MARIA CATHERINE ANNA KEMP; b. October 30, 1783.
iv. JOHN GEORGE MAIN, b. September 01, 1787; m. MARIA ELLEN HILDEBRAND. v. SUSANNAH MAIN, b. February 28, 1790.
vi. JOHN JACOB MAYNE, SR., b. January 05, 1794, Frederick Co., MD; d. July 08, 1872, Frederick Co., MD; m. SARAH SALLY BOPST. vii. DAVID H. MAIN, b. October 05, 1796; d. February 28, 1876, Frederick Co., MD; m. SARAH ANN WISE. 7. JOHN FREDERICK "FRED"3 MAIN, SR. (GEORGE ADAM " ADAM"2 MAIN/MEHN/MAINE, JOHANN GEORGE1 MEHN) was born April 17, 1774, and died April 30, 1850 in Frederick Co., MD. 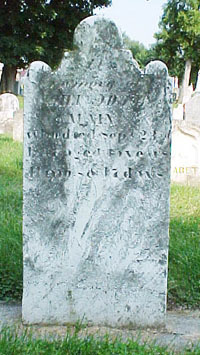 He married MARY SUSANNAH STINE/STONE 1793, daughter of JOHANNES STEIN/STINE/STONE and ELIZABETH. She was born October 24, 1775, and died April 09, 1825. Frederick's will bequeathed land called "New Bremen" to his son John Adam, as given to Frederick by his father. John Adam predeceased father who had not changed will, and so property became subject to court case. Land went to Daniel, and Frederick Main bought land; Daniel then bought-out Frederick. 9. i. JOHN "ADAM"4 MAIN, b. October 06, 1801, Frederick Co., MD; d. September 23, 1847, Frederick Co., MD. ii. JOHN J. MAIN, b. November 09, 1798; d. Bet. 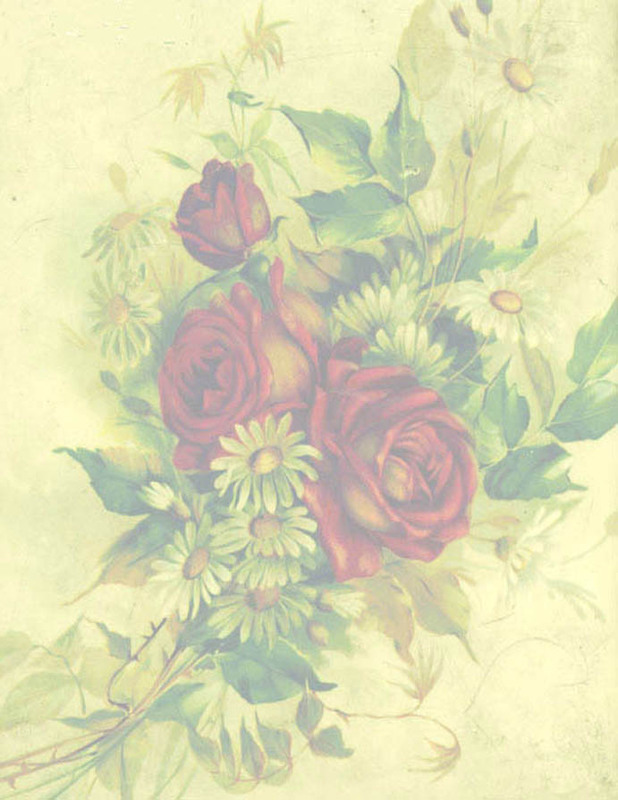 1860 - 1870; m. ELIZABETH SMITH; b. November 03, 1786; d. December 10, 1850.
iii. ELIZABETH MAIN, b. January 04, 1800; d. March 23, 1875; m. JACOB SUMMERS, February 15, 1829; b. November 24, 1791; d. October 05, 1868. 8. CATHARINE3 MAIN/MEHN (JOHANN GEORG2, JOHANN GEORGE1 MEHN) was born December 1771, and died July 12, 1855. 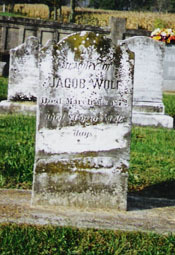 She married (1) JACOB WOLFE, SR.. He was born February 1788, and died March 1872. She married (2) JACOB DELAUGHTER II. He was born Abt. 1768, and died Abt. 1806.
i. SARAH "SALLIE"4 WOLFE, b. August 13, 1808; d. September 09, 1887, Frederick Co., MD; m. JACOB LEATHERMAN, May 10, 1824; b. October 03, 1799; d. February 13, 1880, Frederick Co., MD. ii. JACOB WOLFE, JR., b. February 1813; d. October 1896; m. MARY REBECCA DRILL, September 29, 1834; b. October 14, 1816; d. December 12, 1916.
iii. 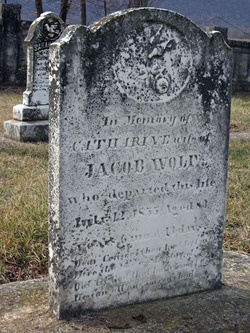 SAMUEL JACOB WOLFE, b. February 14, 1811; d. November 03, 1893; m. BARBARA WHITMORE, July 26, 1831; b. February 03, 1811; d. December 02, 1869.
iv. GEORGE WASHINGTON4 DELAUGHTER, b. January 25, 1791.
v. MARY DELAUGHTER, b. Abt. 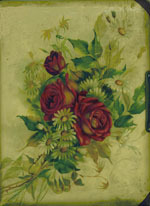 1792.
vi. DANIEL DELAUGHTER, b. 1793.
vii. JACOB DELAUGHTER III, b. August 20, 1794.
viii. ELIZABETH "REBECCA" DELAUGHTER, b. 1796.
ix. SUSANNA DELAUGHTER, b. July 19, 1798.
x. CATHERINE DELAUGHTER, b. Abt. 1800.
xi. JOHNATHAN DELAUGHTER, b. Abt. 1800.
xii. NANCY ANN DELAUGHTER, b. July 1805. 9. JOHN "ADAM"4 MAIN (JOHN FREDERICK "FRED"3, GEORGE ADAM " ADAM"2 MAIN/MEHN/MAINE, JOHANN GEORGE1 MEHN) was born October 06, 1801 in Frederick Co., MD, and died September 23, 1847 in Frederick Co., MD. 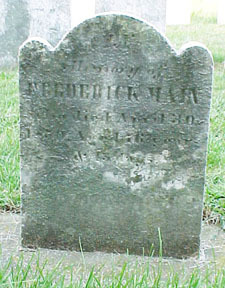 He married SARAH "SALLIE" LEATHERMAN May 08, 1824, daughter of GODFREY LEATHERMAN and MARY RECHER. She was born August 07, 1802, and died January 31, 1841 in Frederick Co., MD. 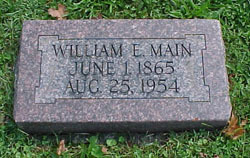 10. i. WILLIAM HENRY5 MAIN, b. October 06, 1838, Maryland; d. February 05, 1915, Brunswick, MD. 11. ii. GEORGE ADAM MAIN, b. November 30, 1825, Maryland; d. August 03, 1904, Madison Co., IN. iii. SUSANNA ELIZABETH MAIN, b. March 31, 1829; d. July 10, 1893; m. RICHARD MUMFORD; b. December 26, 1828; d. September 23, 1896.
iv. MARY ANN MAIN, b. November 16, 1830; d. July 12, 1852.
v. JOHN FREDERICK "FRED" MAIN, b. 1834; d. Ohio; m. MARY J; b. Abt. 1840, Virginia. vi. FRANCIS EDWARD MAIN, b. September 05, 1836; m. ANNA REBECCA HIMES. vii. SAMPSON CORNELIUS MAIN, b. July 17, 1841; d. Aft. 1937; m. ADELINE M. GOODRICH; b. Abt. 1852; d. January 26, 1897. 10. WILLIAM HENRY5 MAIN (JOHN "ADAM"4, JOHN FREDERICK "FRED"3, GEORGE ADAM " ADAM"2 MAIN/MEHN/MAINE, JOHANN GEORGE1 MEHN) was born October 06, 1838 in Maryland, and died February 05, 1915 in Brunswick, MD. He married MARGARET ELIZABETH MARTIN May 03, 1858 in Brownsville, Washington Co., MD, daughter of WILLIAM MARTIN and MARY GURLEY . She was born August 16, 1842 in Pennsylvania, and died May 25, 1880 in Pendleton, Madison Co., IN. 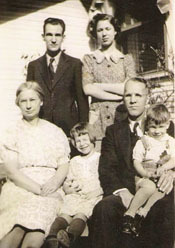 After William Henry's mother Sallie died, he and wife Margaret followed Sallie's sister Aunt Becky Leatherman Summers to the Pendleton, Madison Co., IN, area. 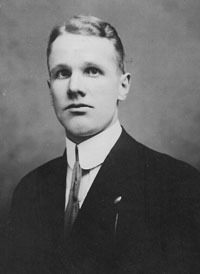 Brother George Adam Main came to Pendleton, IN, also. 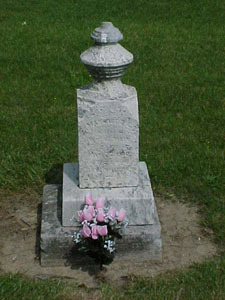 George stayed and is buried at Beech Grove Cemetery, Green Township, IN, with wife Caroline. on 1850 census as "Margaret" Martin for Creagerstown, Frederick Co., MD, with husband William Martin, daughter Margaret, 7 years old, John 4, Mary 2, and a William Milliack 38.
on 1860 census as Mary A. Martin at Rohrersville, Pleasant Valley, Washington Co., MD, with daughter Mary J 12, John 14, Emma 10, and Catherine 6; husband William Martin died between 1853-ish & 1860 census. on December 15, 1866, Mary Ann Martin married George (not Grover) W. Yourty/Yourtee, 1803-1882, in Washington Co., MD; source: Washington County, Maryland, Marriage Index, 1861-1949.
on 1870 census Mary Yourtee for Brownsville, District 11, Washington Co., MD, 2nd wife of George W. Yourtee, aged 66.
on 1880 census as Mary Yourtee for Sandy Hook, Washington Co., MD, with George W. aged 76.
died March 13, 1886; buried at Old Brownsville Church of the brethren Cemetery, Washington Co., MD, with 2nd husband George Yourtee and his first wife Mary Marr. working theory: possible father Moses Gorley 1850 census 67 years old, born 1783 PA, at Creagerstown, Frederick Co., MD. Moses on 1830 census for Adams Co., PA, with 1 white female 5 thru 9, etc. 1840 census Moses 57 y.o. in District 5, Frederick Co., MD. no female 15-19, but Mary may be shown on 1840 census for relative Thomas Gurley, District 10, Frederick Co., MD as persons employed in his manufacture and trade, etc. 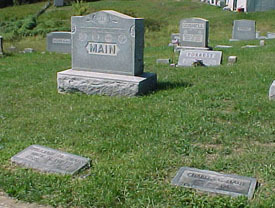 The Main section in Park Heights Cemetery, Brunswick, Maryland. 12. i. WILLIAM EDWARD6 MAIN, b. June 01, 1865, Madison Co., IN; d. August 25, 1954, Madison Co., IN. 13. ii. JOHN WEBSTER MAIN, b. May 01, 1860. 14. iii. 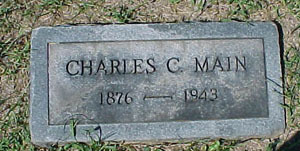 CHARLES MAIN, b. August 08, 1876.
iv. MARY CATHERINE MAIN, b. April 08, 1862; m. JOHN ALVIA WISEMAN; b. June 19, 1862. Fact 1: had one daughter, BESSIE, married a SCHMIDT. 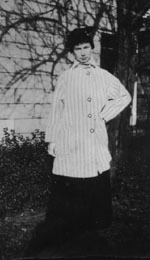 v. CORA CLEMENTINE MAIN, b. November 20, 1872; m. THOMAS MINGLE. Fact 1: had four children: BLANCHE, married a CAREY; NELLIE, married a CLARK; BILLY; MABEL, married a ESTEN. vi. 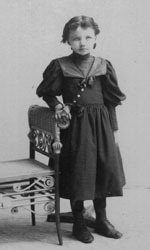 EMMA FLORENCE MAIN, b. June 18, 1868; m. CHARLES HENNINGER. vii. GEORGE W. MAIN, b. 1859.
viii. DORTHA S. MAIN, b. February 10, 1878. 11. GEORGE ADAM5 MAIN (JOHN "ADAM"4, JOHN FREDERICK "FRED"3, GEORGE ADAM " ADAM"2 MAIN/MEHN/MAINE, JOHANN GEORGE1 MEHN) was born November 30, 1825 in Maryland, and died August 03, 1904 in Madison Co., IN. He married CAROLINE BISER, daughter of JOHN BISER and MARY ROUTZAHR. She was born October 04, 1818, and died July 03, 1884 in Pendleton, IN. i. EMMA6 MAIN, b. 1852. 15. ii. 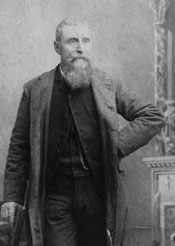 CHARLES PETER MAIN, b. May 04, 1854; d. April 21, 1923.
iii. SARAH MAIN, b. 1857. 16. iv. ADAM MAIN, b. 1860. 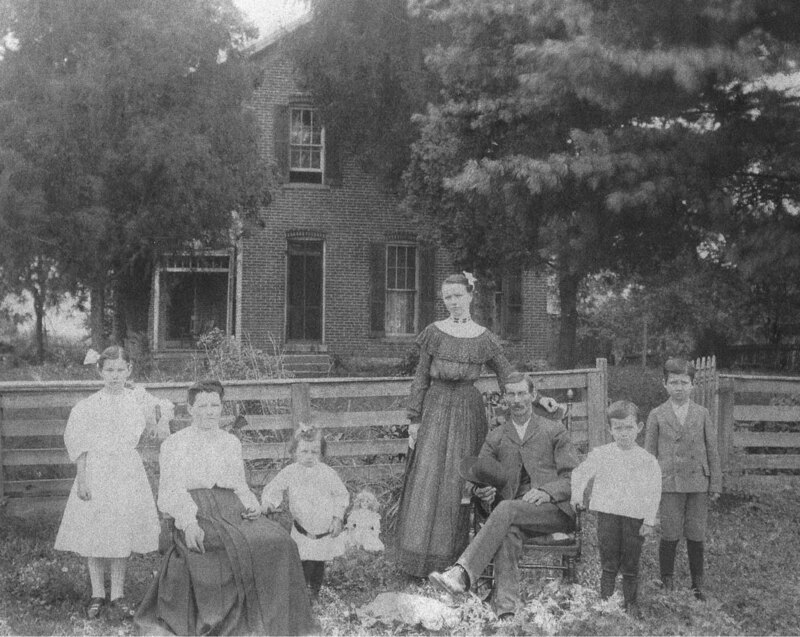 The William Edward Main family, above, in front of their brick farm home on what is now 32nd Street, Anderson, Madison County, Indiana, left to right: Nellie, wife and mother Hannah Virginia Kuhn Main, Russell, Pansy, William Edward Main, John Dyson, and Thamar. 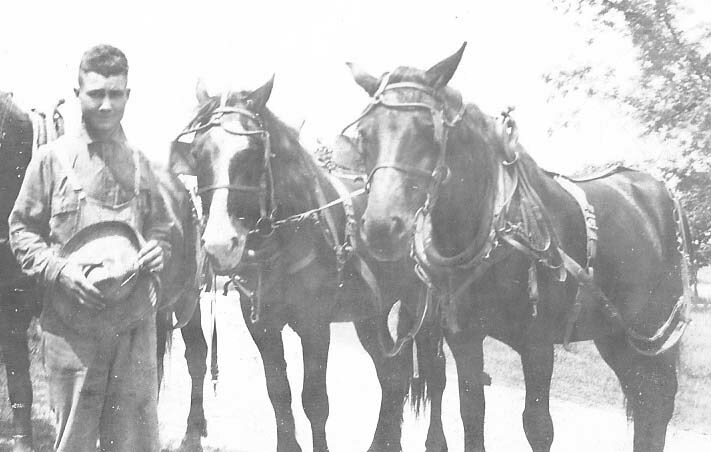 From the early 1900s, the William Edward Main family with horses in front of the family's bank barn. From L-R, Thamar, William Edward, wife Hannah Kuhn, Russell, Pansy, Dyson, and Nellie. 12. 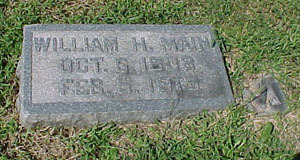 WILLIAM EDWARD.6 MAIN (WILLIAM HENRY5, JOHN "ADAM"4, JOH N FREDERICK "FRED"3, GEORGE ADAM " ADAM"2 MAIN/MEHN/MAINE, JOHANN GEORGE1 MEHN) was born June 01, 1865 in Madison Co., IN, and died August 25, 1954 in Madison Co., IN. He married HANNAH VIRGINIA KUHN, daughter of JOHN KUHN and HANNAH PRYOR. She was born October 14, 1870 in Frederick Co., MD, and died July 02, 1947 in Anderson, Madison Co., IN. Main family members at East Maplewood Cemetery, Anderson, Madison Co., IN. 17. i. NELLIE RUTH7 MAIN, b. January 26, 1895, Anderson, IN; d. M arch 28, 1983, Anderson, IN. 18. ii. THAMAR MAIN, b. June 09, 1899; d. 2000. 19. iii. RUSSELL MAIN, b. January 17, 1902; d. January 21, 1997. 20. iv. JOHN DYSON MAIN, b. December 15, 1897; d. 1928.
v. PANSY MAIN, b. March 17, 1888, Anderson, IN; d. 1967, Anderson, IN. vi. 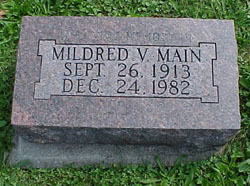 MILDRED MAIN, b. September 26, 1913; d. 1982. 13. JOHN WEBSTER6 MAIN (WILLIAM HENRY5, JOHN "ADAM"4, JOHN FREDERICK "FRED"3, GEORGE ADAM " ADAM"2 MAIN/MEHN/MAINE, JOHANN GEORGE1 MEHN) was born May 01, 1860. He married HARRIET ISABELLE CASKEY January 05, 1888. 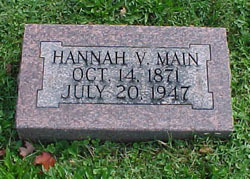 She was born May 11, 1868, and died September 07, 1941. 14. CHARLES6 MAIN (WILLIAM HENRY5, JOHN "ADAM"4, JOHN FREDERICK "FRED"3, GEORGE ADAM " ADAM"2 MAIN/MEHN/MAINE, JOHA NN GEORGE1 MEHN) was born August 08, 1876. He married LOUISE ELLA PHILLIPS. 15. CHARLES PETER6 MAIN (GEORGE ADAM5, JOHN "ADAM"4, JOHN FREDERICK "FRED"3, GEORGE ADAM " ADAM"2 MAIN/MEHN/MAINE, JOHANN GEORGE1 MEHN) was born May 04, 1854, and died April 21, 1923. He married CLARA BERGINIA BISER. She was born May 31, 1854, and died June 13, 1933.
i. ROSA7 MAIN, b. October 01, 1876. 16. ADAM6 MAIN (GEORGE ADAM5, JOHN "ADAM"4, JOHN FREDERICK "FRED"3, GEORGE ADAM " ADAM"2 MAIN/MEHN/MAINE, JOHANN GEORGE1 MEHN) was born 1860. He married CARRIE DACTER July 29, 1883.
i. EMMA7 MAIN, b. September 06, 1887; d. March 14, 1888. 17. NELLIE RUTH7 MAIN (WILLIAM E.6, WILLIAM HENRY5, JOHN "ADAM"4, JOHN FREDERICK "FRED"3, GEORGE ADAM " ADAM"2 MAIN/MEHN/MAINE, JOHANN GEORGE1 MEHN) was born January 26, 1895 in Anderson, IN, and died March 28, 1983 in Anderson, IN. 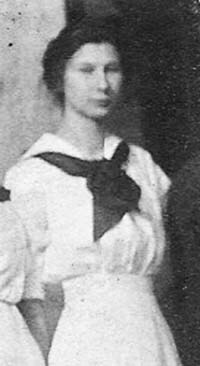 She married ADDISON LEWIS DILTS May 20, 1916, son of ELSA/ELZA DILTS and CORA LANE. He was born March 01, 1893 in Madison Co., IN, and died June 1973 in Anderson, Madison Co., IN. 21. i. KATHERINE VIRGINIA8 DILTS, b. July 28, 1920, Anderson, IN. 22. ii. 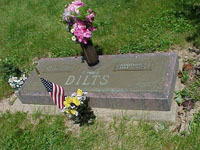 WILLIS MARCUS DILTS, b. June 13, 1917, Anderson, IN. 23. iii. JEANNE ANN DILTS, b. December 04, 1932, Anderson, IN. 24. iv. JACKIE LEE DILTS, b. June 05, 1935, Anderson, IN. 18. THAMAR7 MAIN (WILLIAM E.6, WILLIAM HENRY5, JOHN "ADAM"4, JOHN FREDERICK "FRED"3, GEORGE ADAM " ADAM"2 MAIN/MEHN/MAINE, JOHANN GEORGE1 MEHN) was born June 09, 1899, and died 2000. He married DONNA IRENE PURSLEY. She was born September 24, 1901, and died 1991.
i. PAUL M.8 MAIN, b. December 27, 1923. 25. iii. 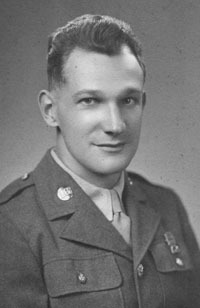 HERBERT G. MAIN. v. THAMAR MAIN, JR., b. September 26, 1922; d. April 15, 1945, Margrotton, Holland (WW II). 19. RUSSELL7 MAIN (WILLIAM E.6, WILLIAM HENRY5, JOHN "ADAM"4, JOHN FREDERICK "FRED"3, GEORGE ADAM " ADAM"2 MAIN/MEHN/MAINE, JOHANN GEORGE1 MEHN) was born January 17, 1902, and died January 21, 1997. He married MARTHA FLORENCE SAMPSON. She was born January 18, 1904, and died June 02, 1983.
i. DOROTHY8 MAIN, b. July 06, 1924; m. RONALD KERN, August 02, 1946; b. October 12, 1924. 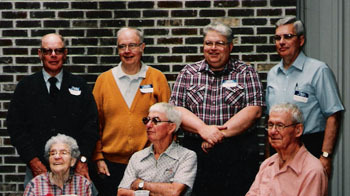 Front row, L-R, Donna, wife of Thamar, Thamar, and Russell; Back row, L-R, Kenneth, Paul, John, and Herbert Main. 20. 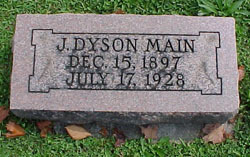 JOHN DYSON7 MAIN (WILLIAM E.6, WILLIAM HENRY5, JOHN "ADAM"4, JOHN FREDERICK "FRED"3, GEORGE ADAM " ADAM"2 MAIN/MEHN/MAINE, JOHANN GEORGE1 MEHN) was born December 15, 1897, and died 1928. He married MARY GEORGE HODGES. She was born 1899, and died 1935.
iii. JOHN DYSON MAIN, JR..
21. KATHERINE VIRGINIA8 DILTS (NELLIE RUTH7 MAIN, WILLIAM E.6, WILLIAM HENRY5, JOHN "ADAM"4, JOHN FREDERICK "FRED"3, GE ORGE ADAM " ADAM"2 MAIN/MEHN/MAINE, JOHANN GEORGE1 MEHN) was born July 28, 1920 in Anderson, IN. 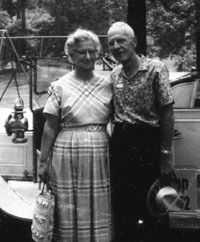 She married JOHN PHILLIP SUMMERS June 27, 1947 in Anderson, IN, son of CARL SUMMERS and LOIS DECKER. He was born June 01, 1921 in Orestes, IN. 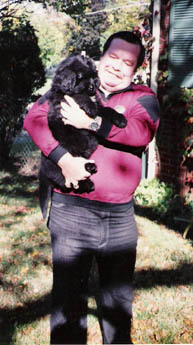 i. MELODY9 SUMMERS, b. April 30, 1948, Muncie, IN; m. THOMAS A. HULL, March 25, 1972, Anderson, IN; b. March 29, 1948, Anderson, IN. 22. WILLIS MARCUS8 DILTS (NELLIE RUTH7 MAIN, WILLIAM E.6, WILLIAM HENRY5, JOHN "ADAM"4, JOHN FREDERICK "FRED"3, GEORGE ADAM " ADAM"2 MAIN/MEHN/MAINE, JOHANN GEORGE1 MEHN) was born June 13, 1917 in Anderson, IN. 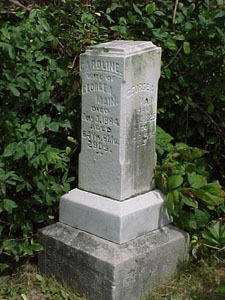 He married CELIA MAE HOPPES in Indianapolis, IN. 23. JEANNE ANN8 DILTS (NELLIE RUTH7 MAIN, WILLIAM E.6, WILLIAM HENRY 5, JOHN "ADAM"4, JOHN FREDERICK "FRED"3, GEORGE ADAM " ADAM"2 MAIN/MEHN/MAINE, JOHANN GEORGE1 MEHN) was born December 04, 1932 in Anderson, IN. She married ALLAN DEAN BRUMFIELD. He was born October 12, 1925, and died June 24, 2004 in Anderson, Madison Co., IN. i. JULIE ANNE9 BRUMFIELD, m. WILLIAM "BILL" FRANKLIN. 24. JACKIE LEE8 DILTS (NELLIE RUTH7 MAIN, WILLIAM E.6, WILLIAM HENRY5, JOHN "ADAM"4, JOHN FREDERICK "FRED"3, GEORGE ADAM " ADAM"2 MAIN/MEHN/MAINE, JOHANN GEORGE1 MEHN) was born June 05, 1935 in Anderson, IN. He married PHILLIS ELAINE SLONE March 09, 1963 in Anderson, IN. 25. 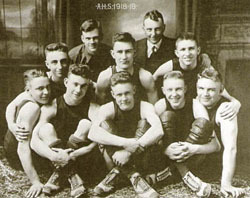 HERBERT G.8 MAIN (THAMER7, WILLIAM E.6, WILLIAM HENRY5, JOHN "ADAM"4, JOHN FREDERICK "FRED"3, GEORGE ADAM " ADAM"2 MAIN/MEHN/MAINE, JOHANN GEORGE1 MEHN) He married BETTY. 26. 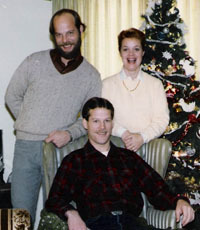 CAROL9 DILTS (WILLIS MARCUS8, NELLIE RUTH7 MAIN, WILLIAM E.6, WILLIAM HENRY5, JOHN "ADAM"4, JOHN FREDERICK "FRED"3, GEORGE ADAM " ADAM"2 MAIN/MEHN/MAINE, JOHANN GEORGE1 MEHN) She married RAY ALLRED. 1. 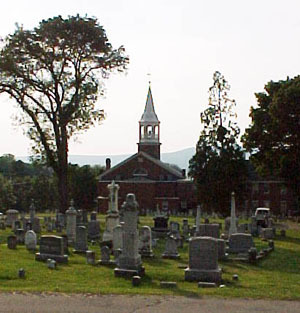 JOHANN GEORG1 WEIL/WILES was born February 23, 1727 in Germany, and died December 06, 1801 in Frederick Co., MD. He married MARIA ELISABETHA 1748 in Frederick Co., MD. She was born Abt. 1726, and died Bef. 1790 in Frederick Co., MD. 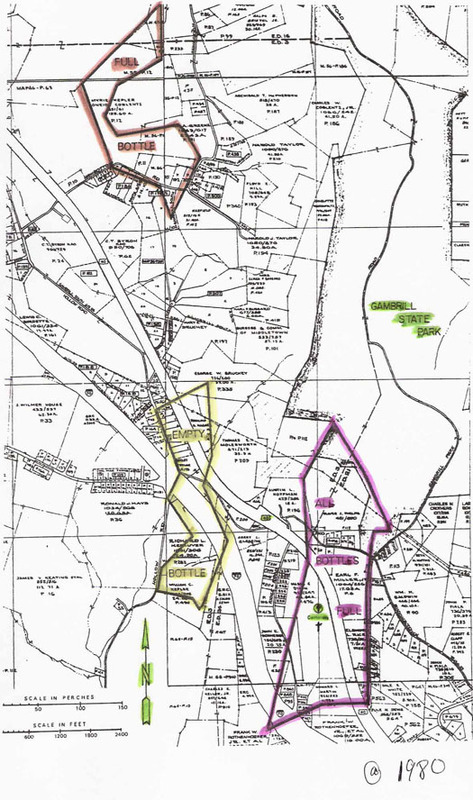 property also described as "Wiles Ending," located where the Middletown High School is and adjacent to north of US 40 south of Harmony and southwest of US 70. 2. i. APOLLONIA2 WEIL, b. Abt. 1750, Frederick Co., MD; d. Bef. 1790, Flatlands Dutch Reformed Church, L.I.,NY. 3. ii. ANNA ELISABETHA WEIL/WILES, b. February 07, 1751, Frederick Co., MD. iii. JOHANN ANTONIO WEIL/WILES, b. 1754, Frederick Co., MD; d. Bef. December 1801.
iv. MARIA SUSANNAH WEIL/WILES, b. 1754; d. Aft. 1775; m. PETER WIESINGER, Abt. 1775, Frederick Co., MD. v. MARIA ANNA WEIL/WILES, b. January 01, 1758, Frederick Co., MD; d. Aft. 1798; m. HENRY KNAUF, JR., Bef. 1790, Frederick Co., MD. vi. JOHANN GEORGE WEIL/WILES, b. March 18, 1760, Frederick Co., MD; d. April 14, 1760, Frederick Co., MD. 4. vii. GEORG PETER WEIL, b. May 11, 1761, Frederick Co., MD; d. Bef. May 15, 1832, poss. Creagerstown Dist. Frederick Co., MD. viii. MARGARET WEIL, b. 1774. 2. APOLLONIA2 WEIL (JOHANN GEORG1 WEIL/WILES) was born Abt. 1750 in Frederick Co., MD, and died Bef. 1790 in Flatlands Dutch Reformed Church, L.I.,NY. 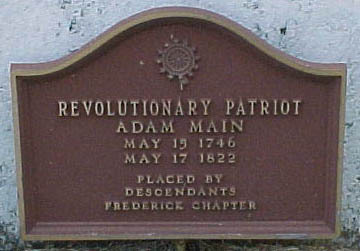 She married GEORGE ADAM " ADAM" MAIN/MEHN/MAINE 1770, son of JOHANN MEHN/MAIN and ELIZABETHA. 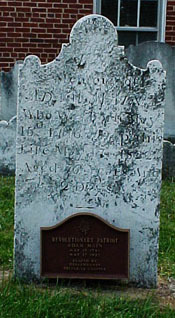 He was born May 15, 1746 in Frederick Co., MD, and died May 17, 1822 in Frederick Co., MD. i. JOHN FREDERICK "FRED"3 MAIN, SR., b. April 17, 1774; d. April 30, 1850, Frederick Co., MD; m. MARY SUSANNA STEIN/STINE/STONE, 1793; b. October 24, 1775; d. April 09, 1825. 3. 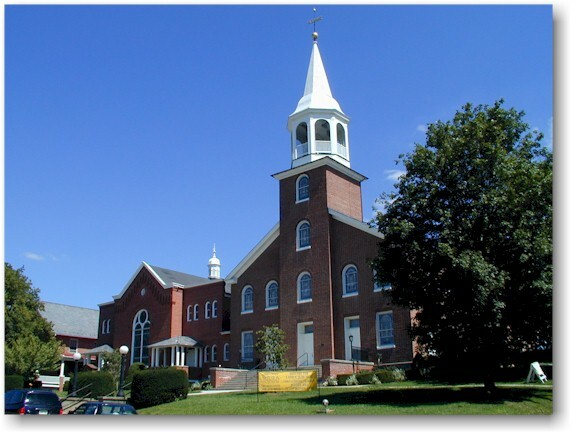 ANNA ELISABETHA2 WEIL/WILES (JOHANN GEORG1) was born February 07, 1751 in Frederick Co., MD. She married JOHANNES STEIN Bef. 1773 in Frederick Co., MD. 4. 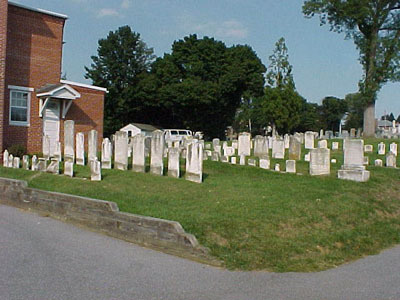 GEORG PETER2 WEIL (JOHANN GEORG1 WEIL/WILES) was born May 11, 1761 in Frederick Co., MD, and died Bef. May 15, 1832 in poss. Creagerstown Dist. Frederick Co., MD. He married MARIA MAGDALENA JANTZ October 14, 1783 in Frederick Co., MD, daughter of JOHANN YOUTSEY and ANNA SENORS. She was born October 01, 1762 in Middletown, Frederick Co., MD, and died February 13, 1847 in Frederick Co., MD.